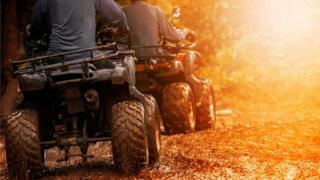 Planners have approved a bid for a new quad bike attraction in rural Gwynedd despite concerns from residents about the potential noise impact. Dragon Raiders Activity Park in Llanystumdwy already offers segway, paintball and bushcraft activities. In addition to concerns over noise from the 50cc and 350cc bikes, a councillor claimed neighbours were not consulted. The park's director said it had commissioned a sound report which found noise levels "well within" the limits. The applicants also want to open for business seven days a week from the current five-day week, a move which was approved. They say the development would create three jobs and would not require any substantial development other than the new course being marked out on their land. "Local residents say they can hear the paintballing very clearly as it is, so imagine how bad it will be with six quad bikes running around the site," local councillor Aled Evans told Monday's planning committee meeting in Pwllheli. Paul Good, managing director of the activity park, said: "We have followed all council processes in obtaining permission to set up [the] business."